Happy New Year to one and all!! It is the start of a brand new year for all of us and I'm pretty sure it is going to be a splendid year ahead. Other than growing a year older, I am pretty excited to get the year started! Personally, 2013 has been a really great year for me. I finally took a step towards my own vision of how I wanted my life to be like (personal as well as work wise) and with the support of my love ones, everything has turned out just right! 2013 has also allowed me to spend more time with my family and friends. This is so important to me now, especially when my brother is out of the country. In terms of work, I have found the stability I needed and I am loving every minute of my teaching time now. The past year has also allowed me to bond with these new students of mine on a different level and I'm so proud to say that I have done my very best to coach each and everyone of them at their differing learning levels and to add on to my pride, all my students did well for their examinations. Kudos to them for their hard work and perseverance. They have proven to me that I have made the right choice and it is all worth it. Carrying forward the positive energy from 2013, I hope 2014 is going to be filled with good health, sweet happiness and so much love from your love ones! Let us all count our blessings from 2013 and welcome the joy that 2014 will be bringing us. 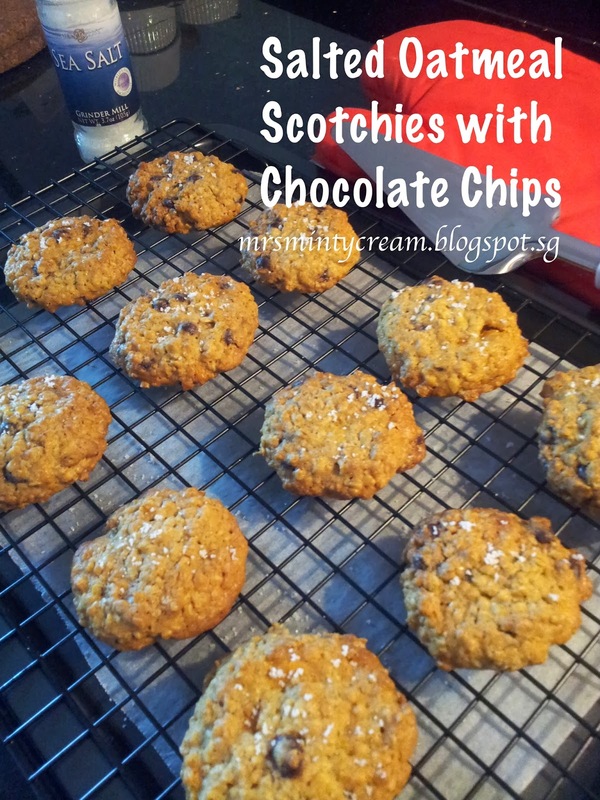 At Mrs Minty Cream, what better way is there than to start off our 2014 with a lovely post on my latest baked goodies, Salted Oatmeal Scotchies with Chocolate Chips. 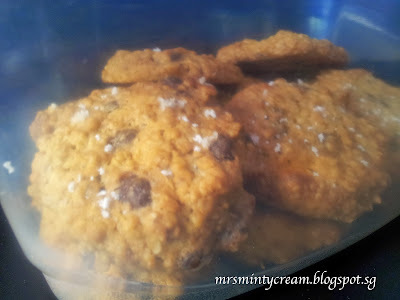 For those of you who are familiar with oatmeal cookies, you will know that many of the recipes involved the addition of raisins. While I agree that the texture of the oatmeal and raisins do complement each other very well, I did not want to do that as both my hubby and myself aren't great fans of raisins. 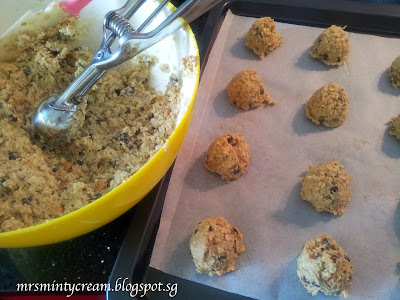 Furthermore, since I have some butterscotch morsels left over from making my Butterscotch Molten Lava Cake with Chantilly Cream last week, I decided to make these Oatmeal Scotchies. 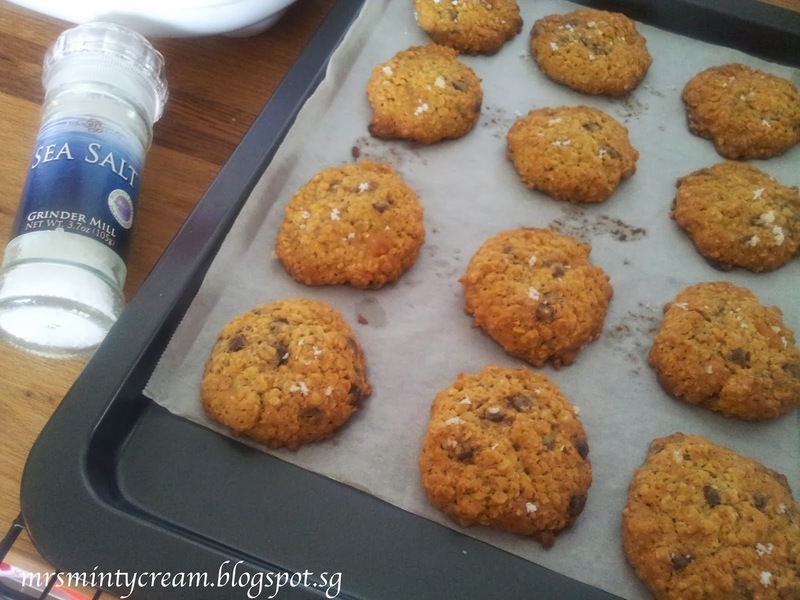 I have also added in some chocolate chips to make the cookies more flavourful and at the same time, I added a touch of sea salt to the cookies which in my opinion, was the icing on the cake! The contracting flavour in the salt and the sweetness from the morsels/chips was a great combination. 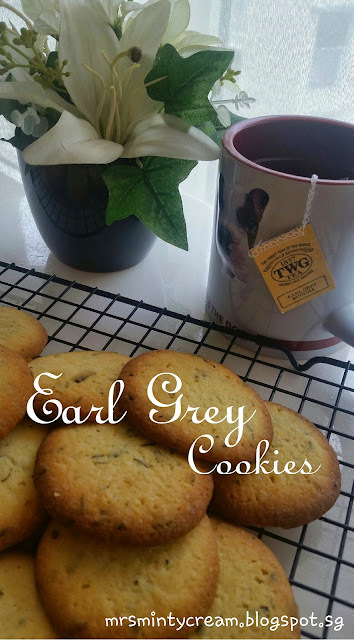 Hubby and I love these cookies so much! Trust me, you will have to make these to share with your family to show them some love today. You just have to do it! 2. 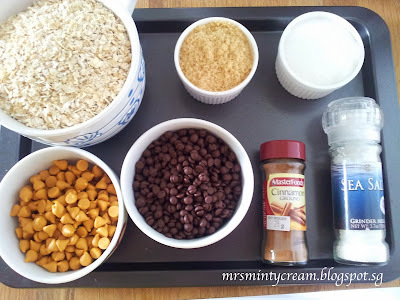 Prepare 2 large baking trays and line them with baking paper. Set aside for later use. 3. Combined the flour, baking soda and cinnamon in a mixing bowl. 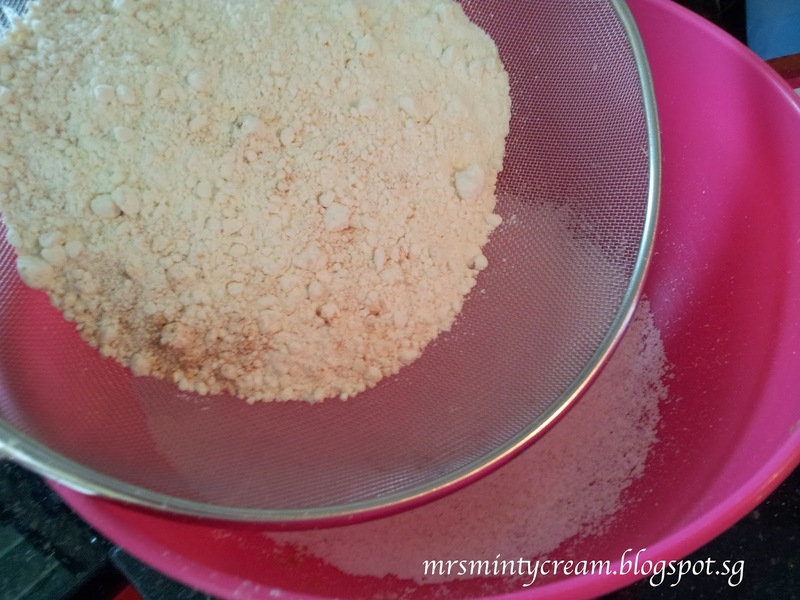 Sift this flour mixture and set it aside. 4. 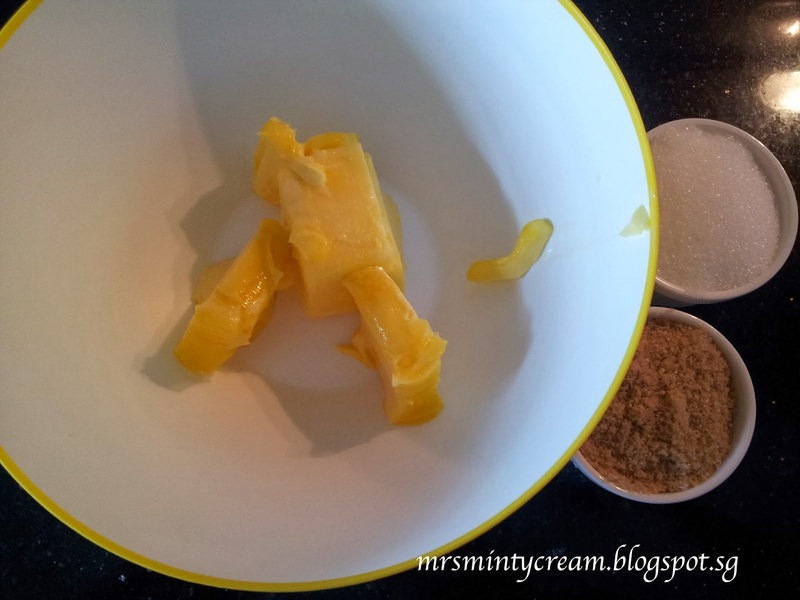 In a bowl, cream together butter with both sugar until light and fluffy. Do this for at least 2 to 3 minutes to ensure a good mix. 5. Add egg and vanilla extract into the mixture and beat until smooth. 6. Add in the flour mixture (in Step 3) 1/3 portion at a time and mix well to combine. 7. Add the oats, butterscotch morsels and chocolate chips to the batter and use a spatula to mix well. Ensure that all the ingredients are well-incorporated. 8. Use a small ice-cream scoop to divide the dough into small portions (ball-shaped) and place them on the baking trays. Ensure that they are at least 3 cm apart from one another. 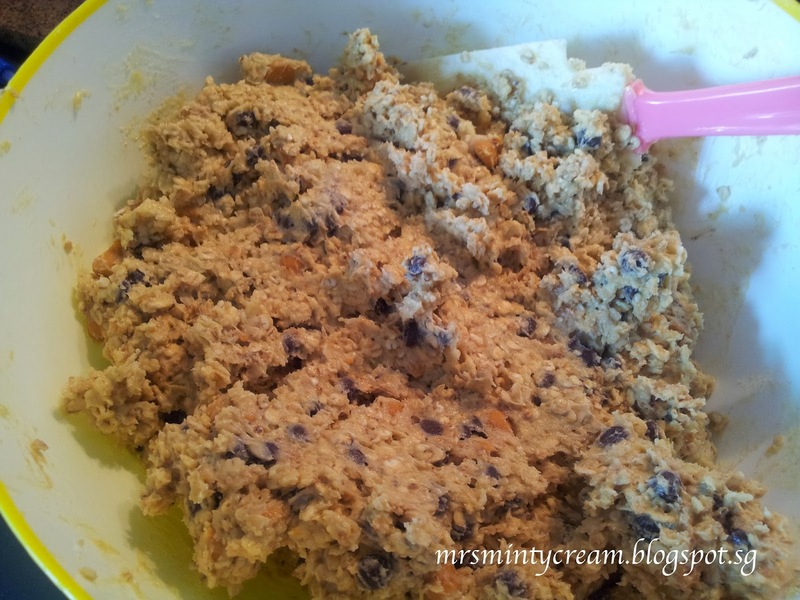 Flatten the top of each small cookie dough with the back of a teaspoon lightly. 9. 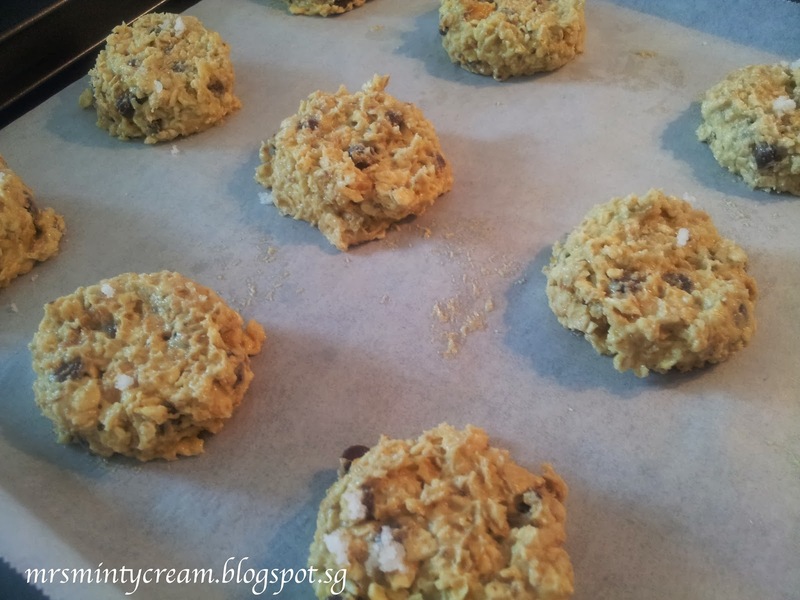 Bake for 8-10 minutes, until the edges of the cookies start to turn light golden brown. Allows the cookies to cool on the baking trays for about 5 minutes before transferring them to a cooling rack to cool completely. 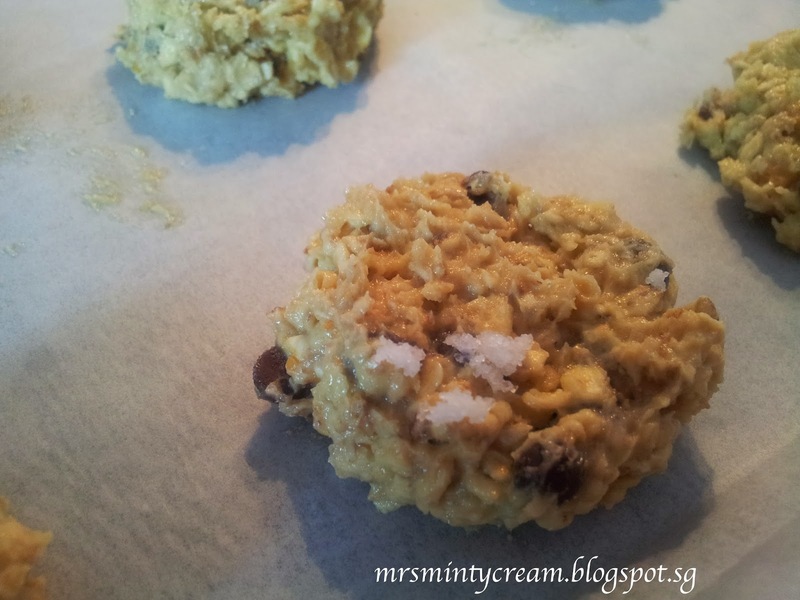 Before serving, sprinkle the top of each cookie with a few flakes of salt.